The Williams FW08C is a modified FW08 to comply with the 1983 regulations. As the FIA banned ground effect and required all cars to have a flat bottom, the big, inverse wing shaped sidepods were replaced by smaller and simpler versions to create as little drag as possible. Powered by a Ford Cosworth 3l engine, the car suffered a major lack of downforce compared to the turbo engines. As a result, the car was only good on slow twisty circuits, while at the faster venues it could simply not keep up with the crude power of engines by Ferrari, BMW, Hart, TAG (by Porsche) and Renault. Williams did switch from a five speed to a six speed gearbox, but to little avail. 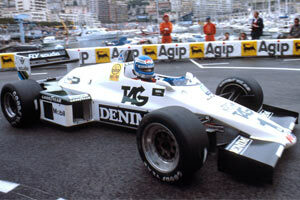 The chassis itself proved efficient enough for one win, the most prestigious, as Keke Rosberg crossed the line at Monaco. The team finished the season with 38 points and were looking forward to 1984, thanks to a turbo engine deal with Honda for the Williams FW09.